- The POWER6 processor, available at frequencies of 4.2 GHz and 4.7 GHz. - Specialized POWER6 DDR2 memory that provides greater bandwidth, capacity, and reliability. - The 1 Gb or 10 Gb Integrated Virtual Ethernet adapter that brings native hardware virtualization to this server. - EnergyScale technology that provides features such as power trending, power-saving, capping of power, and thermal measurement. - Mainframe continuous availability brought to the entry server environment. 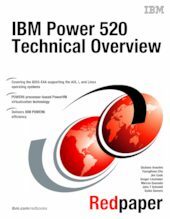 This Redpaper expands the current set of IBM Power System documentation by providing a desktop reference that offers a detailed technical description of the Power 520 system. This Redpaper does not replace the latest marketing materials and tools. It is intended as an additional source of information that, together with existing sources, can be used to enhance your knowledge of IBM server solutions.